So, I’ve been mega slack on this and well, really pretty much posting anything on this website in the past month or so but I do have good reason for that and you’re going to get all the crazy stories coming up pretty soon. The last time I left this off, I had just recapped the opening rounds of the GNCCs so I guess that will bring up to right after the opening round of the ATVMX Series. While I was in Florida, Bart Hayes from Powersport Grafx approached me about a job. I thought it over for a little bit and committed to it in Georgia. Well once I got home, I was basically there for a couple of days and then packed up everything and moved to North Wilkesboro, NC. It’s about an hour and a half west of where I was living. Well, maybe it was a process that ended up taking a couple of weeks to find a place and get what few things I have in, but regardless, that’s the and part of why I’ve been slack posting here… Actually, as I sit here posting this I have one room that is totally empty, and I’ve yet to get a couch in here as well. Anyway, the Steele Creek GNCC went fairly normal for me. Really isn’t anything overly exciting that happened through the weekend except for the fact that it was sleeting on Thursday, and I nearly froze to death, then I had short sleeves on Saturday. One of the interesting stories from Steele Creek came during the morning quad race. I was at one point along the track as my friend Jesi Stracham came by. I gave her a little cheer as she went by and about 5 seconds later I hear “HEY!”. I run down the trail and her quad had died. It was just a battery but with no kickstarter and a Rekluse, there wasn’t really anything we could do. I pushed her down a massive hill with the hopes that somehow it would magically start. I jumped on my quad and came down to find her sitting there. I ended up towing her back. Bummer. On Sunday during the youth bike race, Braxton McGee stopped next to me on the first lap with his footpeg stuck in an upward position. After trying to kick it a few times, I realized that wasn’t going to do it so I grabbed my hammer from the quad and proceeded to beat the living hell out of it until it went back into position. Braxton thanked me on the podium too. Merica. So the Thursday after Steele Creek, Jesi Stracham and I decided to do an evening ride at Brown Mountain. (She also has a bike, which she elected to ride) I figured we had about an hour to ride before it was too dark to see. Well, we took off on one trail and, oh yeah, neither one of us had ridden Brown in several years. Anyway, we were just kind of following the trail and it’s starting to get darker, and darker, and darker. Eventually, I got to the point where I almost couldn’t see. After following this trail for what seemed like forever, we ended up making our way back onto the main trail and followed it back down the mountain to the parking lot. We cut it pretty close to being out in the woods at completely pitch dark too. The next morning, I had to head to Muddy Creek for the 2nd round of the ATVMX series but we decided that we had enough time for a morning ride since it’s not far to Muddy Creek. This proved to be an EXCELLENT idea! We went out on the same trail that kept us out after dark the day before. About the furthest point out, Jesi’s chain breaks. I ended up pulling a Tommy Harris and towed her with my jersey for a bit until we made it to this hillclimb. Actually, it was a mountain. The towing idea didn’t work on this hill at all as it was just way too soft. I rode my bike to the top and leaned it up against a tree where it merged back to another trail. We started pushing the bike for what seemed like days. After hearing a couple of bikes stop, we called for help and thankfully these guys came down and helped us push the bike to the top of the hill. We went back to the original towing idea which went ok for a little while until we hit a rock face that was a little too slick. At that point, it had started to get later in the afternoon than either of us realized so I ran back to the truck to get Jesi’s phone so she could call into work. While I was there, I found a guy who gave me a masterlink, which I was forever grateful for. Pumped, I blasted back to Jesi and her bike only to find out that the masterlink was the wrong size. There were a few tense phone convo moments and just as we were prepared to abandon all hope, 3 guys on utility quads came up. We strapped her bike to one of the quads and off we went. Jesi and I 2-up on my bike while the quad followed us. We made our way back down to the main trail and waited on the other guy to catch up. After waiting for several minutes, I decided to go back and make sure everything was ok. I found him about a 1/2 mile back. His front brake caliper had come off and kept locking up his front wheel. So, I rode him 2-up ALL the way back to his truck, which he drove up the main trail to where the trail merge was. By the time he got there, his buddies had made their way back around and we all rode back up to his quad, took the front wheel off which we lifted with logs and me standing on one, removed the caliper, and put the wheel back on. We got back down to the trail merger and unloaded Jesi’s bike which she coasted back down to the truck. Originally, we planning on being done in time that I could be at Muddy Creek at a decent time and she could be back in plenty of time for work at 5pm. We got back to the parking lot at 5:30pm. Unbelievable. The following Sunday, we elected to race the Mid-East race in Woodruff, South Carolina. Well after loading up 2 bikes and a quad (Yeah, she decided to pull double duty) we hit the road and apparently Jesi decided to hit it too fast as we BOTH got pulled over at the same time. The actual race went a lot better as Jesi put in a solid ride in her first ever race on 2-wheels to take 2nd in the Women’s class (there were 3 and 1 of them didn’t start.. oops, sorry Jesi) and then she turned around and won the A class on the quad and finished a solid 10th place overall. As for me, well, I snagged a win in the Sportsman class and had terrible lap times and a terrible overall finish as to be expect. 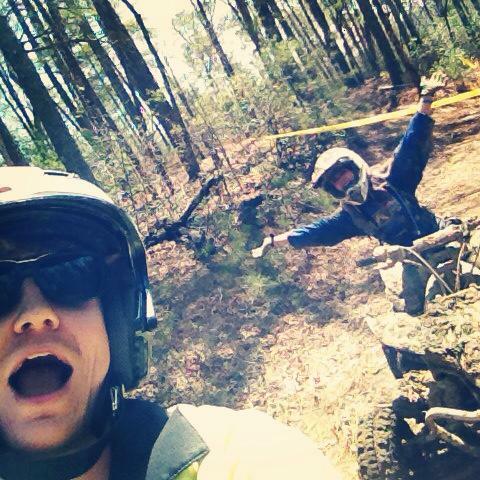 The next weekend was the Big Buck GNCC. It started out normal enough and I went out on Friday on my bike to do some helmet cam stuff for the RacerTV Live Webcast. Well, I opted to give the big hillclimb a shot, from a horrible, terrible line choice. I basically was at the bottom, then turned right and tried to go straight up it. That worked for, oh, about 1/2 way, then about 3/4ths of the way up I bailed off. I ended up dropping the bike and the rear wheel/rear fender wrapped around a tree, so I had to spin it around and try to get that sucker back down the hill. I ended up dragging it down. That was pretty much the only eventful thing that happened all weekend at Big Buck other than finding Steven Squire after he tried to give himself a tracheotomy with his handlebars and seeing that stick stuck in Josh Strang’s face. So, that just about catches me up. I left a lot of things out because if you’re still reading at this point, well, you’re probably bored or something.